We don't just dream of a future beyond Earth. We build it. Finally! I've used that word quite a bit recently, but it certainly applies here. At the San Diego Comic-Con in July last year, Sony Pictures initially launched a viral website called Armadyne for Neill Blomkamp's second sci-fi movie Elysium, but that was before the release was delayed until August. With the extra five months, WonderCon (in Anaheim this past weekend) became the new launching point. Now the Armadyne site has been updated completely fresh with new look and new features, as well as links to a Welcome to the Elysium site with big event sneak previews next week. It's best to suggest just visiting the new Armadyne site (click the screenshot below) and exploring it yourself. 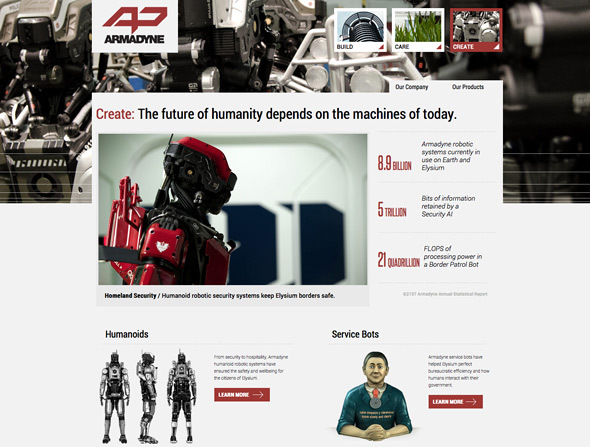 The extensive site contains details about the nefarious Armadyne corporation, including who they are, what they manufacture and their goals, and cool products like all their humanoid robots. This originally linked to a page called It's Better Up There, linked to the Border Patrol bot but that now redirects to an Elysium page. In addition, there is another new site discovered in connection with all of this. It can be found at the URL WelcometoElysium.com and provides an info on the space station Elysium, which is where the film's title comes from. In this future, it's an exotic floating world where the wealthy reside. By Appointment Only. "You won't find a better home on Earth." Because it isn't on Earth! Nice one. A few of the other little details hidden on these two sites are photos of various staff members who are key cast members in Elysium. From the Elysium site under "Our Leaders" it shows Jodie Foster as their "Defense Secretary" as well as Faran Tahir as "Minister Patel, Elysian President". On the leadership page for Armadyne, you will see William Fichtner as their CEO John Carlyle. 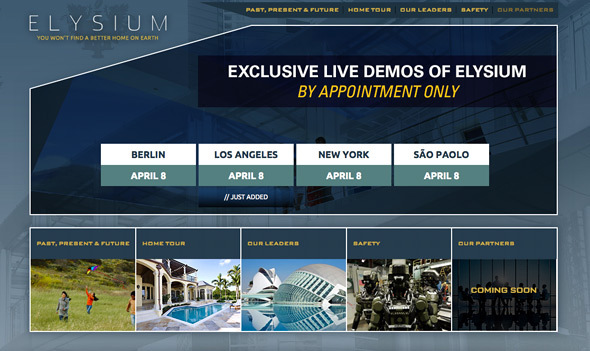 Most importantly, on the Elysium site it mentions an "Exclusive Live Demos of Elysium" and yes that means exactly that - they're showing footage from Elysium at a global event on Monday, April 9th, in four cities. We've been hearing teases and it sounds like it's going to be awesome. Thanks to MovieViral for the tip on this update. I'm happy they're finally getting ready to kick the marketing back into high gear for Elysium, because we've been waiting for so long without anything, not even a trailer. Only those lucky enough to be in Hall H at Comic-Con last year saw the footage, but fans will get a chance next week at these events. We'll be there, too! Follow the Armadyne and Elysium websites for more updates. The droids look so damn cool. I agree. His design is fantastic. When people were complaining about the new Robocop suit, the big issue wasn't that it was changed, it was that it sucked. Look at these design and imagine how cool a Robocop suit could have been if the designers weren't going for an Iron Man/Batman rip-off hybrid. I read the script about a year ago & I've been anticipating footage ever since (especially since the comic-con screenings). Nobody really understands yet that this will be one of the greatest sci-fi films of the 21st century, and possibly all-time. LOVE the military robot design, the design makes it look like it could really work with the pistons (i think) in the neck and the fan on the side. Really can't wait till some footage gets out. Surprised there isn't even a poster yet. (I think once footage gets out of this, its suddenly going to be on peoples top 5 anticipated movies). Sweet! Got my passes for the Hollywood event! GIVE US A TRAILER ALREADY!!! !